Jean (McAnally) Morris October 12, 2013. A common burial ground for early pioneer settlers who camped along the Clear Fork of the Trinity River, the Clark Cemetery consists of many burial sites from the 1830’s. In December of 1853 Reverend John William Godfrey (1825-1897) and his wife Anzaline Barker Godfrey (1831-1859) arrived in Parker County from Missouri. Godfrey established a Methodist church in the Wright Community, Northeast of Weatherford., where they lived. In 1859, Anzaline Godfrey passed away and was buried in the Wright Community burial grounds. In 1880, Jim Clark and William Henry Ward formally established a permanent cemetery at the original location of Godfrey’s Chapel Methodist Church. In 1953, signed documents deed tract #1 and #2 of the land as a burial plot property. Additional land was added in 1958 and 1999. In addition to numerous pioneer families and farmers, Clark Cemetery is the final resting place of a founder of early Parker County Methodist churches, an organizer of Jack County, trustee of an early pioneer school, and a county Chief Justice. The Oldest marked headstone belongs to Anzaline Godfrey, although sixty-five unidentified burial sites from the pioneer era were discovered with ground penetrating radar. The commitment to military service is represented by Veterans from the Texas Rangers, The Civil War, W.W. I, W.W. II, Vietnam, and Korean War. The landscape of the Clark Cemetery is traditional with Live Oak, Elm, and Post Oak trees with a limestone and steel entrance gate, restrooms, and a covered pavilion. 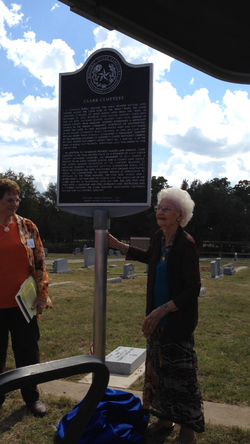 The Clark Cemetery Association continues to care for the historic cemetery.